Even before you enter The Myst Dong Khoi you’ll see that this is not your ordinary hotel. Unlike the surrounding buildings, The Myst Dong Khoi is not just a nondescript structure of metal and glass. Greenery bursts out of the geometric circular and square windows that dot the sides of the building, merging the themes of modern architecture and a return to nature. Facing the river in Saigon’s central District 1, the 5-star Myst Dong Khoi Hotel offers more than just comfort, amenities and convenience. It is a labour of love that incorporates innovative works of art alongside its dedication to luxury. 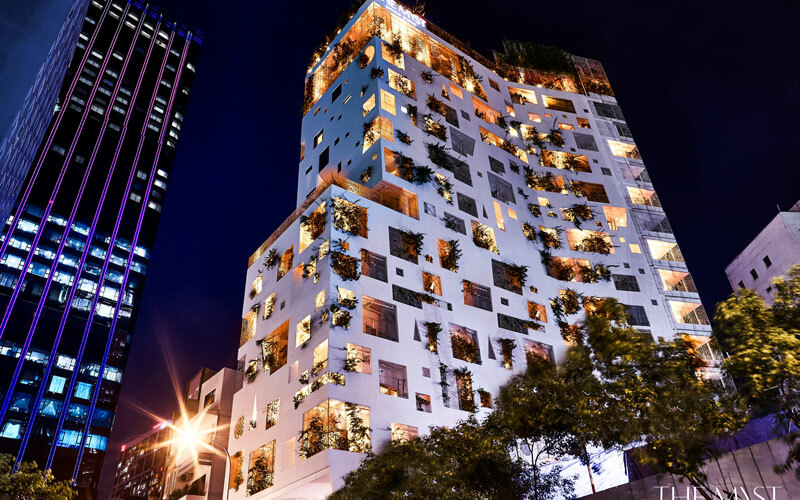 Established in 2017, this 108 room hotel is ideal for business and leisure travellers who are looking for more than a stop-over at a “cookie-cutter” chain hotel in Saigon. Sophisticated world travellers—whether voyaging solo or with friends and family—who are interested in art and culture will be attracted to the hotel’s bold, yet warm stylings. 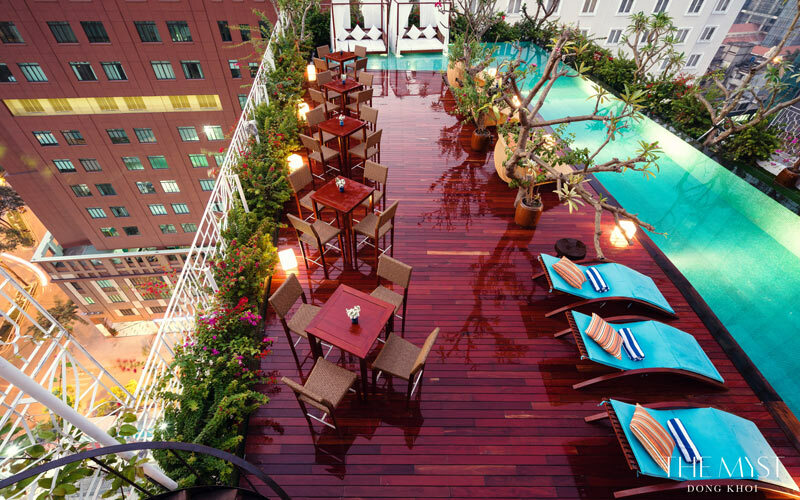 The Myst Dong Khoi is a historic boutique hotel that was designed to showcase a modern celebration of Saigon culture. The Bason café in front of the hotel is punctuated by the addition of two massive anchors hanging on the wall next to the bar. In Vietnam, the anchor represents strength and stability. These are vestiges from the Bason shipyard, an important marine structure originally located along the Saigon river that reflected the history and identity of the city. The shipyard has since been moved to Vung Tao but the hotel keeps the memory of this important landmark alive. 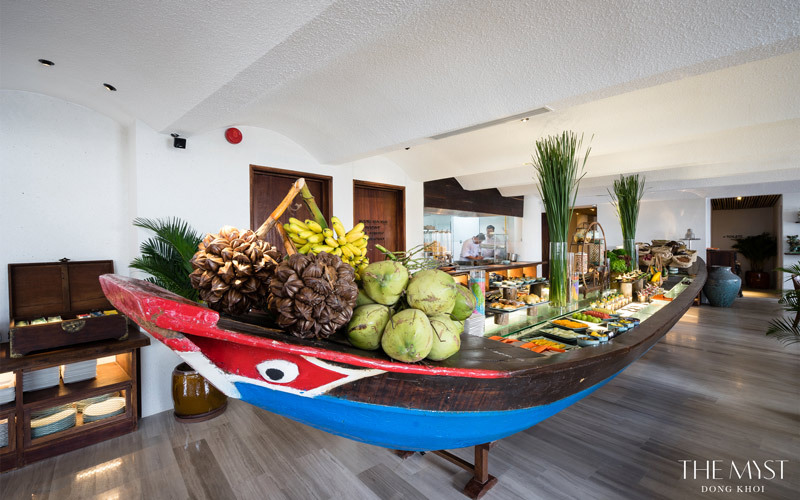 The shipping industry theme is also present in the ceiling in the lobby, which was crafted out of iron ship remnants by a Vietnamese artist and designer, local timber throughout the hotel and the 9-metre long boat in the hotel’s signature Nest restaurant, which is used to display the lavish food buffet. Curving hallways that lead to the rooms mimic the narrow alleyways of old Saigon. Each room is like an individual home furnished with familiar items, such as old chests that could have been passed down through generations, refurbished antique mirrors or traditionally crafted pottery. The rooms are distinctly decorated so that travellers can have a different experience each time they return to the hotel. You can choose a suite or a double room, each one features a private jacuzzi bathtub on the balcony. One of the perks of staying at The Myst Dong Khoi is the incredibly central location. It’s on Ho Huan Nghiep facing the Saigon river, just behind the statue of the famous warrior Tran Hung Dao. Besides the view, The Myst Dong Khoi is also close to everything D1 has to offer from the iconic Nguyen Hue walking street, the Saigon Opera House, Ben Thanh Market, shopping on Dong Khoi and plenty of world-class restaurants. The Myst Dong Khoi has the only rooftop swimming pool in HCMC that truly looks like a resort in the centre of the city. The water is purified using cutting-edge nano-filtration technology to keep the water clean without the use of any chemicals. Have a swim and then lounge next to the pool with a drink from the Bar Bleu rooftop bar. For true luxury, try out the steam room and sauna on the same floor or head down to the full-service KL spa located in a private hem beside the hotel. Guests can also take advantage of the gym, laundry and room service. For business travellers, there is a conference room that completely breaks from tradition. 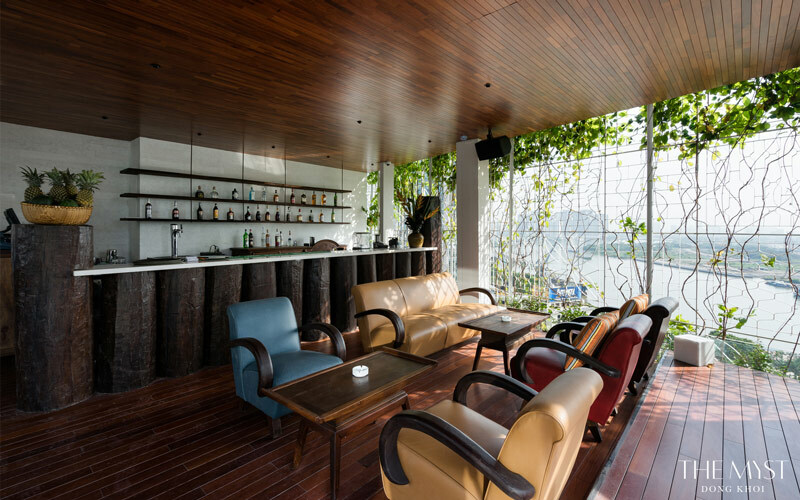 Rather than the typical fluorescent lit, beige carpeted business rooms offered by most hotels, The Myst Dong Khoi’s architects took the time to design an environment. Modelled after the intimate, cocooning effect of a cave, the conference room can seat up to 100 people theatre style and the bespoke lighting can be tailored to your needs. Audio-visual equipment and catering are available upon request. The Myst Dong Khoi has the choice of two Bason coffee bars, one inside the hotel and the other outside. Both cafés have a choice of top Italian or Vietnamese style coffee beverages. On the 12th floor, you’ll find The Nest restaurant, which serves a buffet breakfast with international and local choices, lunch, dinner and high tea. The restaurant is decked out in warm terracotta colours and wooden touches, and the white ceiling is sculpted to mimic the swells of waves. Finally, the Bar Bleu on the rooftop is the best choice for a late night cocktail in style. The Myst Dong Khoi has an enviable 4.5 rating on TripAdvisor with 557+ respondents. Many travellers mention the hip vibe of the furnishings, the comfortable beds, and the convenient location. At The Myst Dong Khoi , you are transported you into the most beautiful parts of Vietnam before you even leave the hotel. Lovers of art and connoisseurs of culture will be pleased by the innovative style of the hotel, all while enjoying the feeling of being in a garden retreat in the centre of the city.